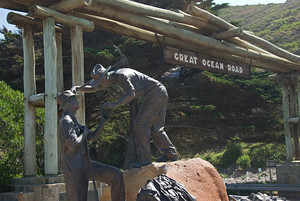 Monument and sign to the builders of the Great Ocean Road. Most of the workers were veterans of WWI. The Great Ocean Road had received a lot of build up as I was sitting in Melbourne. Everyone I talked to told me how amazing it was and how it was the greatest stretch of road in the world. The “great” in Great Ocean Road is certainly merited, but I won’t go so far as to say it is the “greatest”. Probably a top five road. What makes the Great Ocean Road so great are the erosional features you can see on the coast. The southern part of Victoria where the road is located on the coast of the Great Southern Ocean. (Ok, you won’t find the Antarctic Ocean on any maps, but it is often considered a body of water in its own right given the unique currents which exist around Antarctica.) The seas in the southern ocean are the roughest in the world and the cost of Southern Victoria is limestone. The most noteworthy of these erosional features are the Twelve Apostles. As the cliffs are eroding, they do not erode in a uniform way. Depending on the angle the waves hit the shore, you can get inlets, coves and other formation which develop. The Twelve Apostles are limestone stacks where everything else has eroded around it. They are popular because you can see so many of the stacks next to one another in a single location. One reason why I don’t rate the Great Ocean Road higher on the list of all-time great drives is that the formations are sometimes difficult to see from the road. Had the visitor center sign not been on the road, I would have missed the twelve apostles entirely. 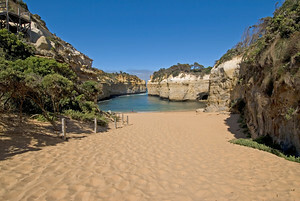 Near the Twelve Apostles is the Loch Ard Gorge, which is a small inlet and beach carved out into the rock. The gorge is named after a ship, the Loch Ard, which sank nearby in 1878. (there were a LOT of shipwrecks in this area). If it wasn’t so populated with tourists and the water so cold, the beach in Loch Ard Gorge would be a great beach. It is hidden and well protected from the wind. It reminds me of the green sand beach on the Big Island of Hawaii in some respects. The other big name attraction in the region is the London Arch. It originally got its name because it had a resemblance to London Bridge (now located in Lake Havasu City, Arizona). You can see the span where the London Bridge collapsed. After the collapse, it was renamed the London Arch. There are many other formations to see along the route, not all of which had names (or at least not signs pointing out the names). 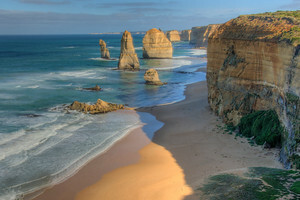 If you are diving from Melbourne, it is possible to at least see the Twelve Apostles on a day trip if you leave early. 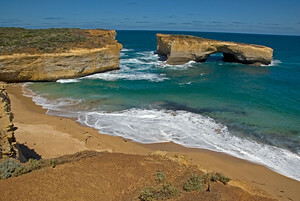 The nearest city to the major formations is Port Campbell, which has small hotels, campgrounds and hostels. Question for commenters: What is your favorite scenic drive? Excellent article, you really bring us into these destinations! I would like to add Acadia National Park in Maine as an incredible scenic destination. The 27 mile Loop Road is especially beautiful with its unique mix of ocean, mountains, rocky coast, forests and lakes. Cadillac Mountain is the tallest mountain on the east coast. Although only 1,532 ft. high, the panoramic views of the ocean and islands are breathtaking, especially at sunset. There are even fjords in Somesville! We like going to Acadia in the late spring when the crowds are not quite as prominent, thus leaving fewer obstructions to enjoy this nature’s wonderland. Without a doubt, Acadia is our favorite scenic destination In New England — or anywhere else we’ve traveled in the United States. I am not much of a traveller, but in late September of this year we did a road trip in the atlantic provinces of Canada – the drive on the Cabot trail in Nova Scotia was quite awesome. Great write up on the Great Ocean Road Gary! I would have to the great ocean road is definitely the best in Australia can’t vouch for the rest of the world. The Canadian side of Lake Huron Circle Tour is pretty nice. It is mostly National Parks and Indian Reservations, so it it fairly pristine, it also has the largest freshwater beach in the world. The ferry across Georgian Bay is fun too. Thanks for the memories, it’s been a few years since i’ve been down that way. The great ocean road is the best in the world! The apostles (rock formations off the coast) are the ones falling in. Great website, thank you for all your exploration and for sharing. I’m going to go with what I’ve recently experienced, as I haven’t travelled a lot YET, The Pacific Coast Highway. I hope to add more! thanks for this post on Great Ocean Road. I lived in Melbourne for more than 2 years, and it’s a pity I wasn’t able to visit this magnificent landscape. Always a pleasure to drop your blog.Keep it up! God bless, and more travels for you! I agree with Barb…the road to Hana is great and so is Big Sur, but Bora Bora is magnificent and the Napali coast on Kuaii is the best…you have to hike it…boats and helicopters don’t do it justice!!! Also LOVE the road up the mountain on Maui to Haleakala Volcano at sunrise!!! I have taken the Hana Coast Drive in Maui, it is amazing. I have also taken the Pacific Coast Hwy. I have to say I agree with you, the Pacific Coast needs overs, and I have my heart sent on doing it again.